Pauline van Dongen, with an interdisciplinary team of researchers, engineers and scientists, is working on developing wearable solar cells. The project was inspired by the need for continuous connectivity especially in environments such as music festivals where power sources are scarce. In hopes of turning our bodies into energy sources for our mobile devices, their team is exploring the seamless integration of solar panels into garments ideally through the development of a solar textile. 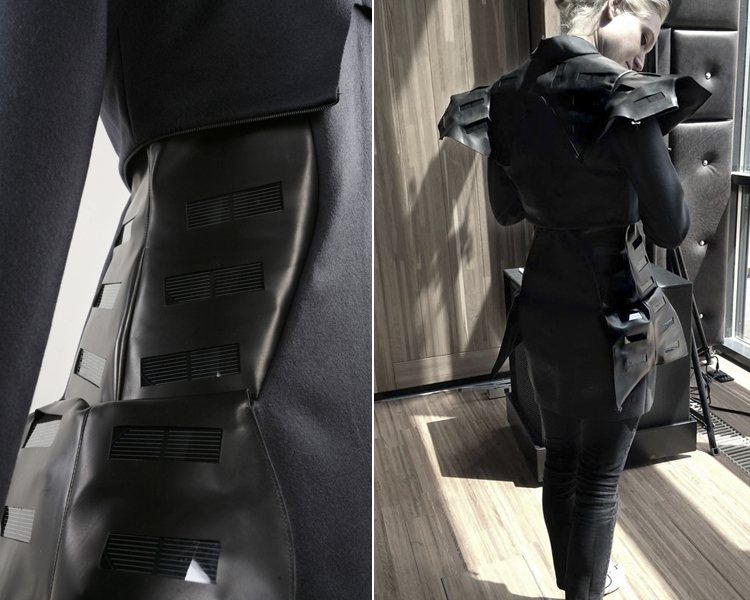 Dongen’s first exploratory garment design was inspired by the structural layers of both the skin and the solar cells. Currently they are seeking funding to continue with the development of the wearable solar project. It is significant to note that a fashion designer was employed at the very early stages of the exploration of this research. I’m looking forward to seeing future iterations. You can follow the development of the project on wearable solar.nl and to learn more about Pauline van Dongen and her work, take a look at this wonderful interview. Documentation images – the making of. Maziar Ghaderi has been featured before with his work on Fashioning Technology with the project One Mile whilst he was a student at OCAD University, Toronto Canada. Ghaderi has a keen interest in performance and translating the action and movement of performing into the digital medium. His tool for doing this is wearable technology. His new project, Dissolving Self, feeds into his current area of studies which explores the space where performance art and emerging tech meet. 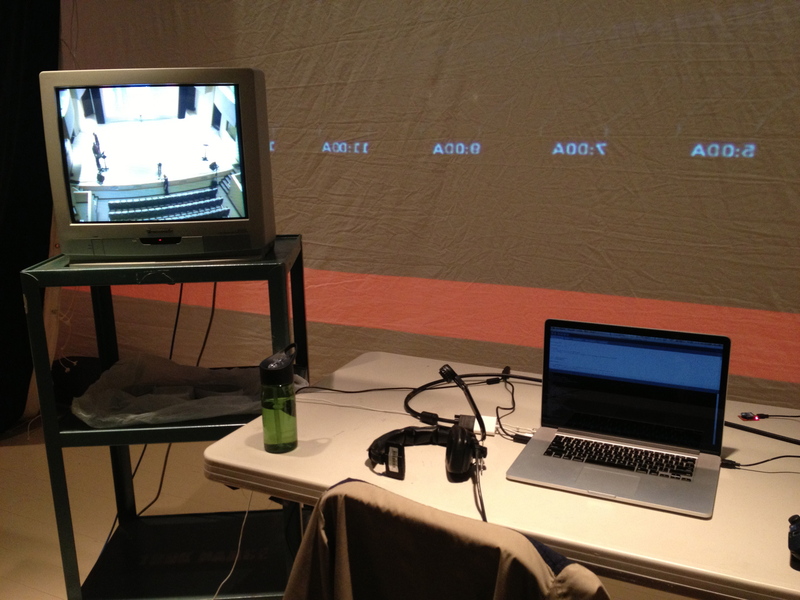 Here is a video of the performance live at HASTAC 2013 (an international conference) at York University in Toronto, Canada. Dissolving Self employs metaphoric data visualization, motion capture and wearable technology to harness the subtle movements of a contemporary dancer. Much of the inspiration of this piece comes from Rumi’s mystic poetry and the physical meditative ritual of Sufi whirling. Technically the piece is comprised of multiple components. A gyroscope and a radio module (Xbee) are worn by the dancer which measure and transmit the speed of rotation of the dancer. A Microsoft Kinect captures lateral movement of the dancer. 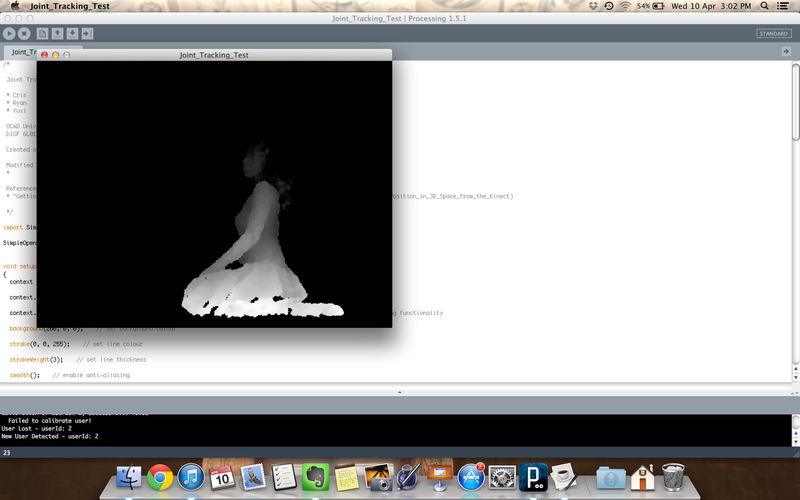 These two sets of live data are fed into Processing, an open source software, to create a responsive and metaphoric visualization that is projected over the dancer. I asked Ghaderi some specific questions about his new work. You are interested in how this piece explores new media technologies and how they “can be used to augment the experience of watching performative art”, how do you feel this is achieved in your latest work? 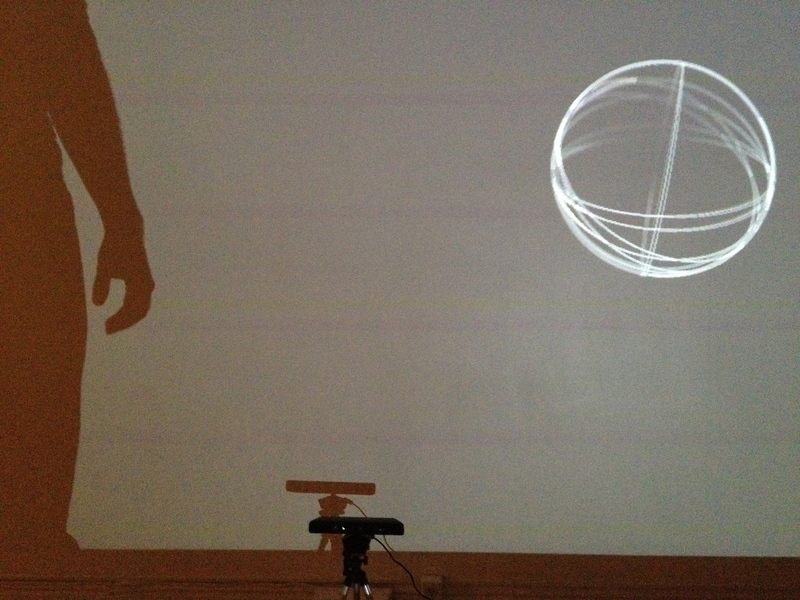 The spherical visualization serves as a second performer, where the whirler eventually interacts with directly. With the use of the technology at the small of her back, the visualization is able to responsively react in real-time and thus creating a unified choreography that doesn’t overwhelm the viewer. How did Rumi’s mystic poetry and the physical meditative ritual of Sufi whirling influence the work, was it mostly aesthetically? Rumi was of course a Sufi poet and much of his teachings deals with paying homage to The Devine which has been portrayed as the cosmos in some scriptures. This and the history of Sufi whirling formed the cosmo-like visualization as well as the narrative of a mortal discovering the heavenly bodies above her, and eventually dissolving into them through meditative prayer. How do you think the data visualisation which occurs from the performance and data affects the viewing of the performance and the performer itself? By choosing a simple geometric graphical visualization as suppose to video, or a more elaborate animation, the viewer’s eyes are given the space to explore both the trace-like movements of the dancer as well as wonder at the visualization like the way one would gaze at the stars or the moon. The original whirling sphere which Ghaderi uses can be found here. 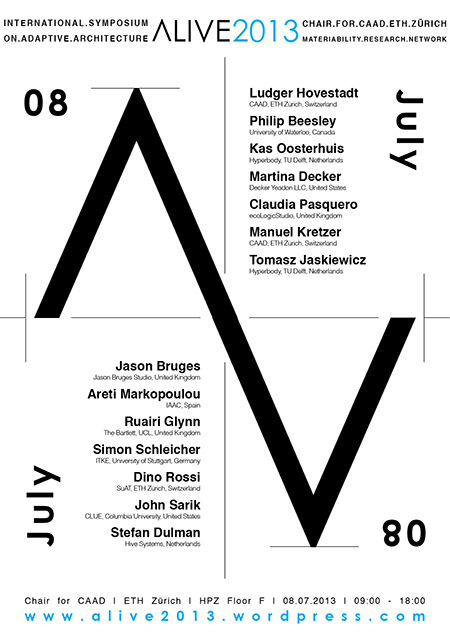 The event is organised by Manuel Kretzer and Tomasz Jaskiewicz, hosted by the Chair for CAAD and supported through the Swiss National Science Foundation. Are you sick of your batteries dying at the very moment you need them to make an urgent call, use a torch to change a blown fuse or find your position on a GPS when you are lost in the outdoors? Let us introduce the Voltmaker, an innovative and fast electricity generator inspired by the ratchet device which is designed to save the day in such situations. 1/At home: fully charge the Voltmaker with your standard USB wall charger (or using a solar panel). 2/ Is your phone’s battery dead? Plug the Voltmaker into your phone. You can fully charge it with the energy contained in your Voltmaker’s battery. 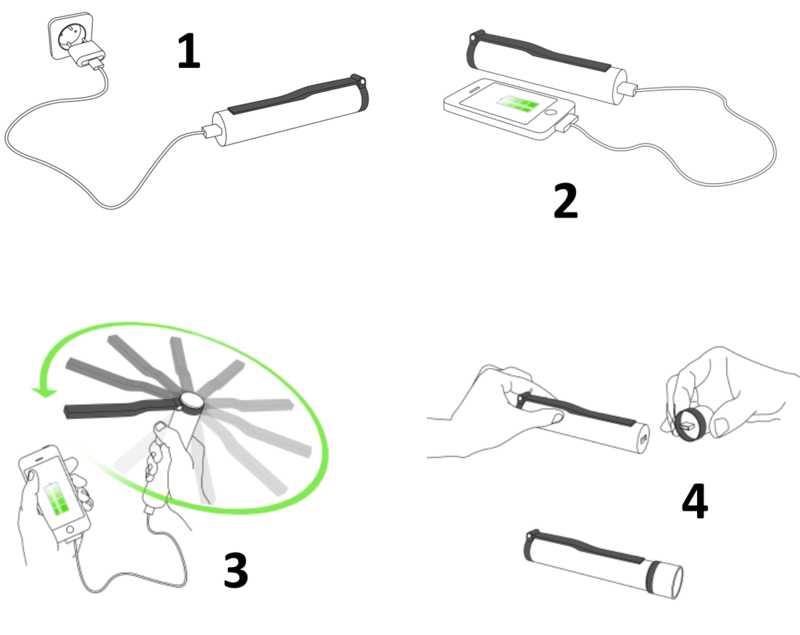 4/ A clever USB system transforms the Voltmaker into a torch, making it multi-purpose. The Voltmaker is ideal for hikers, travellers and businessmen whether in the city or in the countryside and it is particularly useful in places where electricity is scarce. Being small and compact, this device tucks away nicely in your backpack, handbag, glove box or even your jacket pocket, ready to save the day. I designed this 8bit glitch blanket with my prepared Nintendo Entertainment System. The pattern is a composite video capture which was dithered in order to be rendered as a 50/50 merino wool, soft acrylic blanket. The design is knit at a 1:1 pixel to knot ratio, preserving the correlation between textile and pixel art. The result is a 6×5’ glitchy blanket. Check out glitchaus.com for more and follow on twitter and tumblr for updates! I’m republishing here a piece I originally wrote for the site Irenebrination. Dutch Sabine Staartjes likes to define herself as an “eclectic fashion designer”. A graduate of the Hogeschool voor de Kunsten Utrecht, Staartjes often focuses her work on reinventing patterns and fabrics through elaborate processes. For her graduate collection, entitled “Unexpected Expectations”, she employed a Jacquard loom at the passementerie department of the Tilburg-based TextielLab to make thin strips of fabrics that she then wove to make a pixel-like houndstooth fabric. Staartjes employed this fabric to make her designs that she conceived as a commentary about modern society and social interactions between people. The designer recently explored once again the social interaction theme through a new project showcased at the Breda-based Moti Museum during the “Te[ch]x(t)iles” event. The museum, in collaboration with Stimuleringsfonds voor de Creatieve Industrie (Stimulation Fund for the Creative Industry), invited ten designers to present their visions about the future of fashion investigating new technological and communicative developments and showing how new techniques can have an impact on the functions of fashion. Staartjes’s project, entitled “SmartPhocus”, was inspired by modern communication, by our constant need to check ou our smart phones even in the most unlikely places and by the “distant Vs close-by” dichotomy. The designer created two booths where two people meet and carry out a conversation seeing only each other’s head and hands. In this way the people involved focus on the conversation without being distracted by modern technology. The booths, made with a digital printed fabric with images of eyes and ears on brightly coloured psychedelic backgrounds, also feature an application developed by Kristi Kuusk, a designer set on bridging the gap between textiles and interactive product design (her work was recently featured in the Pretty Smart Textiles exhibition). The images printed on the fabric are indeed recognised by the camera embedded in a tablet that displays on the screen augmented layers of noises and information. The application shows the technical noise around us, stresses the importance of focusing on each other, but also hints at a future in which our clothes may be made with a textile capable of constantly changing in the digital world while remaining the same in the real world (see this video to get an idea). Sabine Staartjes: I’m living in Almere, Holland. I was born in Amsterdam and in about two months I’ll be going back there. I studied Fashion Design at the School of the Arts (HKU) in Utrecht, graduating last summer. What’s the main inspiration behind the SmartPhocus project? Sabine Staartjes: SmartPhocus is about having a good conversation without being distracted by your smartphone. With SmartPhocus I wanted to bring back the focus on the exchange between two real people (see video here). 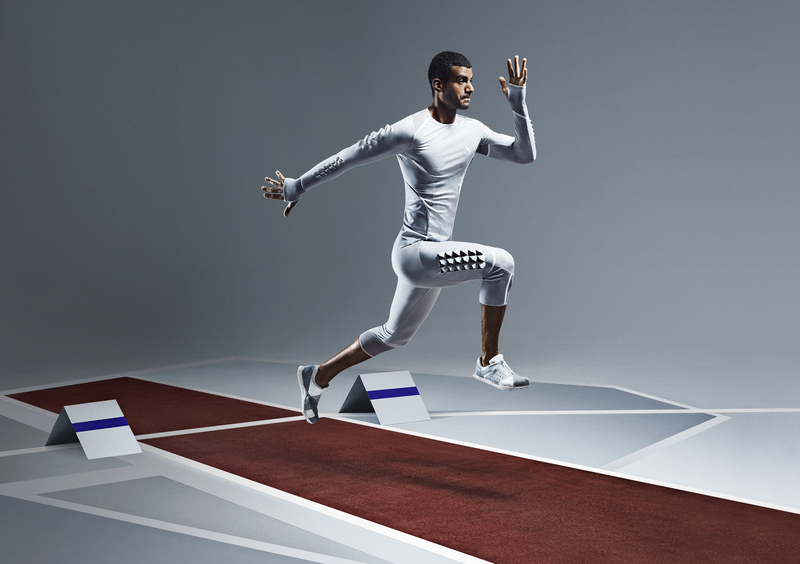 There is a lot of talk at the moment about smart textiles – do you feel that new technologies will help us developing genuinely innovative and functional garments in future? Sabine Staartjes: Yes, I think there are a lot of things happening around smart textiles. For example nano-technology offers so many opportunities to make new fabrics and this is really amazing. So far which is the most challenging technique you used to make your designs? Sabine Staartjes: Two years ago I made a collection called “Knitted Silk”. The name of the collection hints at the technique behind it. I cut silk into strings and knitted it into a top and a jumpsuit. I worked on one top for a whole week; it was really a challenging technique because I came up with it myself. For the collection “Unexpected Expectations” I also used a technique I developed by myself to make my own yarn and weave it. You worked for your graduate collection with the TextielLab, which were the main challenges for that collection yarn-wise/weaving-wise? Sabine Staartjes: I worked in the passementerie department at the TextielLab. We needed three weeks of non-stop weaving on a very old weaving machine to make the ribbon and that was challenging because when you’re working on a collection you usually want to have all the materials you need as quickly as possible. But there are processes at the TextielLab that bring you backwards in time, so you need to be patient. The most challenging experience for me was to cut and weave 500 metres of fabric into a pied-de-poule-inspired fabric. The collection seems to be characterised by a sort of interplay of colours and patterns – did you take inspiration from art to create it? Sabine Staartjes: The inspiration for the collection “Unexpected Expectations” actually comes from cognitive dissonance, a term indicating the feeling of discomfort arising when one is confronted with facts or opinions that contradict one’s beliefs. A good example is the hardening of the society: the different layers of society do not mix well, social contact is minimal and too little effort is made to get to know each other. I do think that society must become more intertwined and people should have more respect for each other. This is why the basic element of this collection is weaving, a technique that hints at the interaction between people. I have used known elements and techniques from the Western culture, but with a new approach such as the pied-de-poule pattern, the T-shirt and the traditional Dutch costume, they were all employed as starting points to create a sort of new costume for a modern society. Zooming in and out of certain parts is also an important aspect of this collection: the designs appear different from a distance than from close-up and encourage the observer to come up close to the person wearing the piece to explore it better. Sabine Staartjes: I used all different kinds of materials. For the ribbons I made in the TextielLab I used wool and metallic thread. The fabrics that I used for the weaving were cotton and velvet. I also employed 200 metres of knitted yarn to make a woven jumpsuit. Is there a technique you’d like to experiment with in future? Sabine Staartjes: In every collection I challenge myself to learn something completely new. In future I would like to learn how to make lace. What are you woking on at the moment? 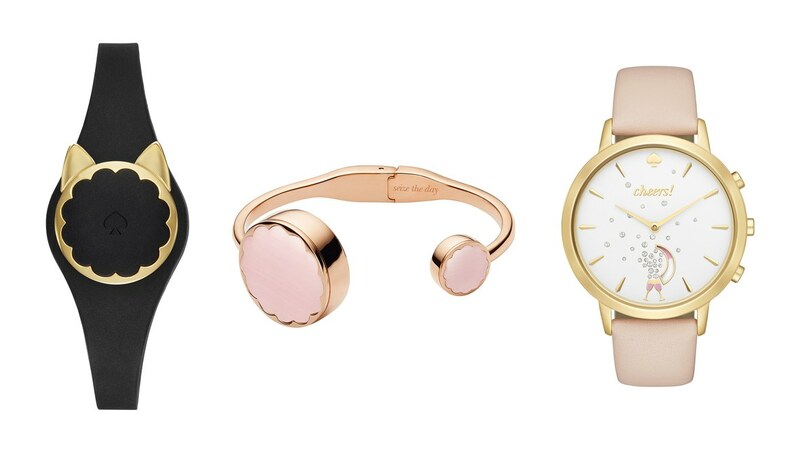 Sabine Staartjes: I’m focusing on my webshop and a new collection. I would like to have my own shop with wearable clothes one day and and also be able to work on collections for exhibitions. The first video embedded in this post is directed, shot and edited by Marijke de Bie for the Te[ch]x(t)iles event. The objective of this workshop is to draw attention to the emerging field of smart material interfaces which spans the areas of design, engineering and architecture. These novel composites, which in some cases are already celebrated as the answer for the 21st. century’s technological needs, are generally referred to as materials that are capable of sensing the environment and actively responding to by changing their physical properties, such as shape, size and color. 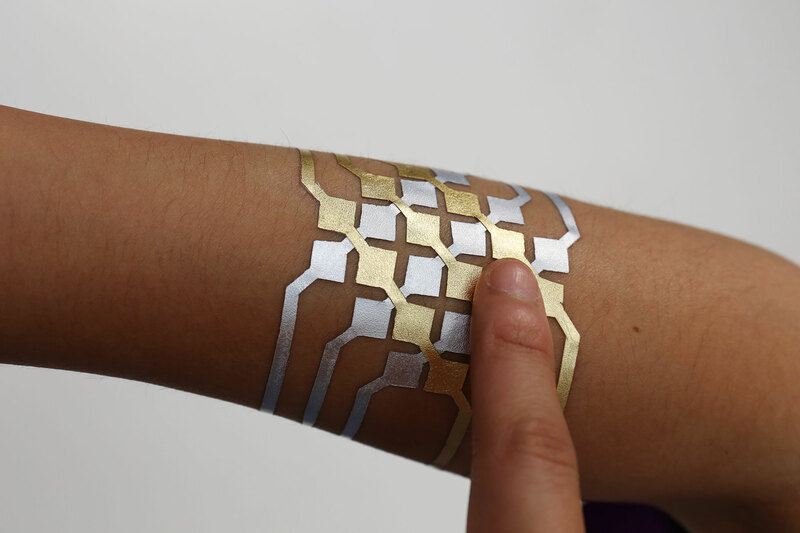 Smart material interfaces, reality-based interfaces, organic user interfaces, programmable matter, smart textiles. information to the user – or allow the user to manipulate information – using different modalities provided by the material’s properties. With the use of smart materials, SMI attempts to overcome the limitation of traditional and tangible interfaces. SMI focuses on changing the physical reality around the user as the output of interaction and/or computation as well as being used as input device. SMI promotes a tighter coupling between the information displayed and the display itself by using the tangible interface as the control and display at the same time – embedding the information directly inside the physical object. It uses the physicality of the object as a way to deliver information. Utilizing smart materials’ properties, SMI can support cohesive interaction by maintaining both channels (input and output) on the same object of interaction. The interaction constructed in this way will grant the user a continuous perception of the object and of the output.